The value of a luxury product (or service) is driven, in part, by the authenticity of the brand. Conventionally, value is determined by the amount that a person is willing to pay. However, an original product will always be worth more than a copy. That is simply how the human mind perceives value. Bootlegged products lack quality, a trademark characteristic of high-end products, due to the need to produce things cheaply. They also lack a story, history, and a sentimental attachment or connection, which is typically formed with genuine articles. As a result, there is less allure; hence, there is less value. The truth is, you don’t NEED an authentic item, but your desire for that item is what makes a product luxurious, and helps to set a brand apart. This concept is easily translated to your personal and company brand. Make a high quality product and deliver high quality service. It has been said that imitation is the most sincere form of flattery. If your product and service is awesome, you will likely be copied. Whether you are a retailer or service provider, your objective is to demonstrate the value in what you offer. This begins and ends with you. People will do business with people they like. Go out of your way to connect with your clients. Tug on their heartstrings. But, make sure to take a genuine interest in them. Most importantly, deliver an amazing experience! 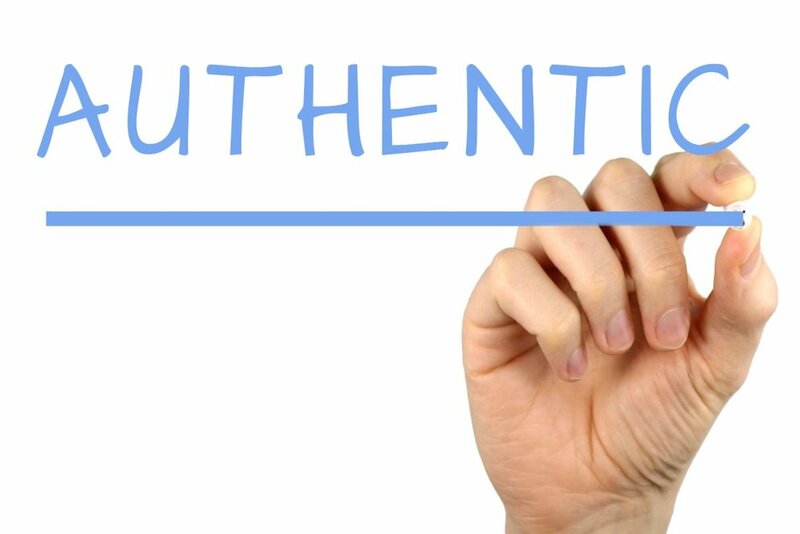 Convey the authenticity in you and your brand. People won’t make a purchasing decision until they know who and what they are getting. The first impression is key; so make sure that you nail this part of the process. This could be a first interaction via website, telephone, advertisement, or referral. At every touch point, ensure that your reputation is pristine, your product / service is of the highest quality, and the experience you provide is second to none. When you were 2 years old, your mother would tell you to “say cheese,” in order to get a smile for the picture that now sits in the family scrapbook. In retrospect, how real was that smile? If it was anything like my childhood pictures, it was as disingenuous as Mariah singing on New Years Eve. Ok, maybe that’s pushing it, but you get the point. Real emotion and connection will carry more weight and get you much further than half-assed “cheesy” smiles and fake concern. Just like with the luxury product market, people aren’t stupid. They can spot a fake a mile away. When people connect with you, they are more likely to do business with you. Disingenuous emotions typically look, and more importantly, feel “salesy.” No one likes being sold to. The last thing you want is to look like a used car salesman. The way you represent yourself could either launch your company brand and reputation, or turn it into knock-off city. With an authentic foundation and a refined appearance, you signal to your client base that you are a polished professional, with a high level of expertise. This is your personal brand, and the perception translates seamlessly to your company brand. What message do you want your client base to receive? What actions are you taking to ensure that the message is sent? I would love to hear your thoughts, so please feel free to drop a comment below.